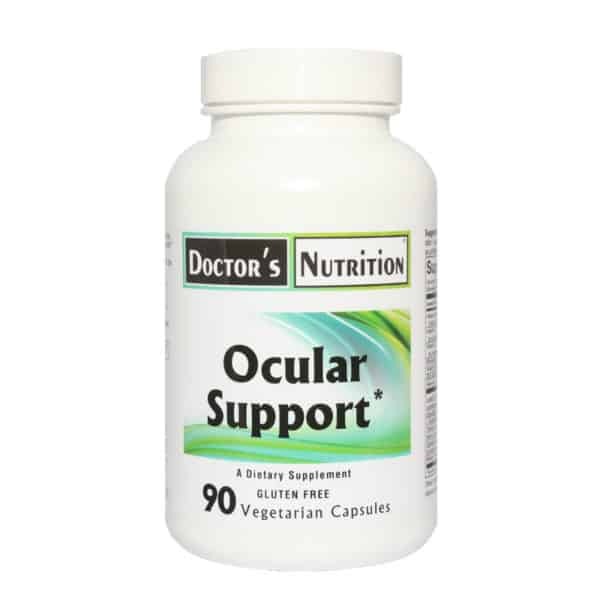 Ocular Support* is a dietary supplement to maintain and support proper visual function. • Alpha Lipoic Acid is an antioxidant that is both fat and water soluble and can extend the biochemical life of other antioxidants such as Vitamins C, E and L-Glutathione. •L-Glutathione is the key antioxidant in the lens. Its major function is to protect the lens from ultraviolet radiation which over time can cause clouding. * The production of Glutathione in the lens declines with age. • Selenium, Zinc & Riboflavin are nutrients necessary for supporting antioxidants such as glutathione and super oxide dismutase. Bilberry (Vaccinium myrtillus L.) fruit: 40 mg.
*Other ingredients: vegetable cellulose, rice flour, vegetable stearate. This product is vegetarian and free of citrus, corn, eggm gluten, milk, sodium, soy, wheat, yeast, added sugars, synthetic dyes, artificial flavorings and preservatives. Suggested Use: As a dietary supplement, take 1 capsule, 3 times daily with meals or as professionally directed.